This year, as part of our Pie Pledges for British Pie Week, we decided to head up to Leeds Leeds Leeds to do a #LeedsPieTour! One place we visited was Haley and Clifford, a lovey quaint deli in the north of Leeds, which features in the video of our adventures made by Pierateer Tim below. 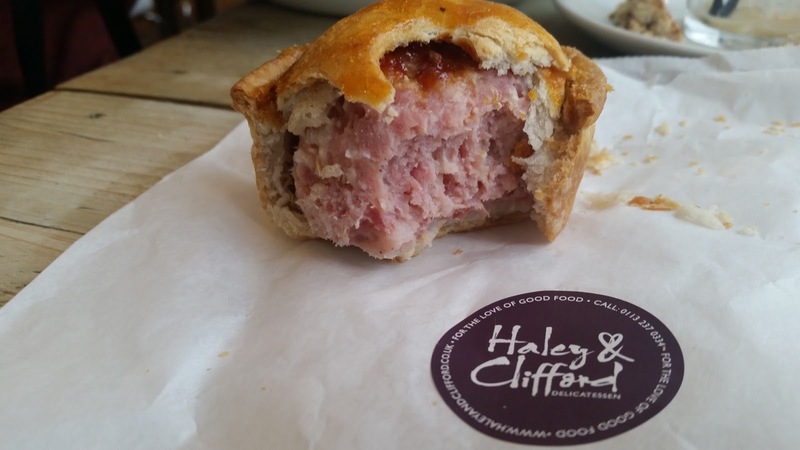 There we rated a Voakes Pork Pie, famed for being a top pie option in the area! The deli was a lovely place to visit on our Pie Tour of Leeds - serving a few different pie options to be eaten cold. The Voakes pork pie however was what we were there for and was a pretty reasonable price for a reasonably high end establishment. It was possibly the first place we'd ever rated which offered an accompanying side salad with your pork pie - a combo Pierateer Sam relied upon during his "Pies For Every Meal" British Pie Week 2014 stunt, which rather amazingly led to Sam losing weight over the week he ate 21 pie meals! The Voakes Pork Pie was very crispy to bite into and while - as said in the video - the first bite was pretty much all pastry, it was a very crisp and delicious pastry I'd happily eat on its own. What the deli owner told us in a chat later was that between receiving the pork pies from Voakes and cooking them, they don't actually add in the jelly which many pork pies contain. They found their customers prefer their pork pies without, which we on the Pierate Ship can understand. We too can find the jelly muddles the flavour a bit, so unless done well, it can be better not to include jelly just for the sake of it! It would however be interesting to rate a Voakes with jelly too sometime! The colour was lovely and golden, with a reasonably even bake, though the pastry did flake and crumble into random pieces upon biting into it, therefore losing some marks for condition. This is perhaps why they offer the pork pie already cut into quarters when serving it with a side salad (see tweeted photo above!) There was a noticeable gap around the meat where the jelly would normally be, thus reducing the capacity slightly. However the meat content of the pie was pretty succulent in spite of the lack of cooking with jelly - nice and meaty. Seasoned but not too strongly, it was a pork pie I'd happily eat again.